Essen is the 2017 European Green Capital, a tangible example of its structural change on the back of decades of intense industrialisation. Essen is the 2017 European Green Capital, a tangible example of its structural change on the back of decades of intense industrialisation. 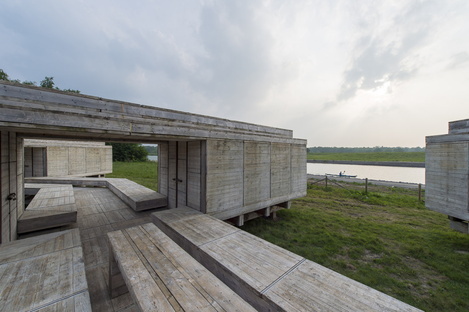 The work called “Warten auf den Fluss” by Dutch collective Observatorium on the river Emscher hosted a meeting about regenerating rivers. Rivers play a very important role in the history of humanity, from the birth of the Mesopotamian civilisations through to the present. Not only are they communication channels and driving forces of development, they also have a specific function in the balance of their local environment, whatever their size. The meeting on 12 August was held at the request of Essen, 2017 European Green Capital with Emschergenossenschaft, the regional authority that for more than 30 years has been working on the regeneration of the Emscher river. This waterway had been turned into an open-air sewer in the post-war period, sacrificed in the name of the industrial development of the Ruhr basin and the meeting took place in a symbolic location: “the zigzag bridge” (link), r in other words the construction crafted by Observatorium for the Ruhr metropolis European Capital of Culture in 2010. This habitable bridge has been on a 7-year journey along the Emscher river, accompanying its developments, hence the name “Waiting for the River”. If you're interested you can even stay overnight on the construction, looked after by Dutch artist Marja Zomer for a close-up, personal experience of the man-made nature in close proximity to the Emscher river. The meeting moderated by Silke Witts from Emschergenossenschaft and called “Wishes and reality on the river, on the Emscher and elsewhere?” focused on the changes of the Emscher that, like so many other rivers around the world, is polluted, choked, separated from the population. With Andre Dekker from Observatorium talking about his visions for the Emscher and the Ruhr, Livegreenblog took the #PicnicenTuRìo experience, an initiative by the Mexican network Cuatrolcubo. With the decentralised organisation of picnics, it is actively engaging people and politicians to focus their attention on the rivers in Mexico City, a city established on a lake (link) These rivers are almost all underground and no longer connect with urban life. Likewise, initiatives are being rolled out in Lebanon for the Beirut River, where young architects and urban planners are using “Beirut Riverless” to raise more awareness of the environmental and social importance of waterways. If you're in Essen and you want to visit “Warten auf den Fluss”, Saturday 27 August is the opening day of the exhibition by Marja Zomer - whose works are generated by her observation of nature around the “bridge” - and the presentation of the book by Barbara Köhler, who wrote her collection of poems during her stay on the construction in 2016.